Users of cloud computing and other digital services need to be certain that cloud service providers can manage the security risks of storing their data and running their applications on cloud systems. Large- scale national and international cybersecurity attacks are now common. This section examines how countries manage and regulate cybersecurity, security certification, and security testing. This year’s Scorecard indicates that many countries have implemented national cybersecurity strategies. Many of these national strategies promote a joint public-private approach to the management of cybersecurity. Overall, this is a positive development, although Argentina, Mexico, and Vietnam are yet to develop and implement strategies. Overall, the Scorecard finds that most countries are rising to the challenge of protecting data from cyber attack and physical security breaches. Most cloud computing applications are designed to meet internationally recognized security standards, and this approach is supported by most countries in the Scorecard. This means that a product tested in one country can be recognized in other countries. However, the Scorecard reveals that some overly prescriptive security requirements that duplicate accepted international standards and impose onerous local requirements have been introduced. For example, China, India, and Korea have all introduced some local security testing requirements. The United Kingdom, Germany, France, Australia, the United States, and Japan score highest in the security section. 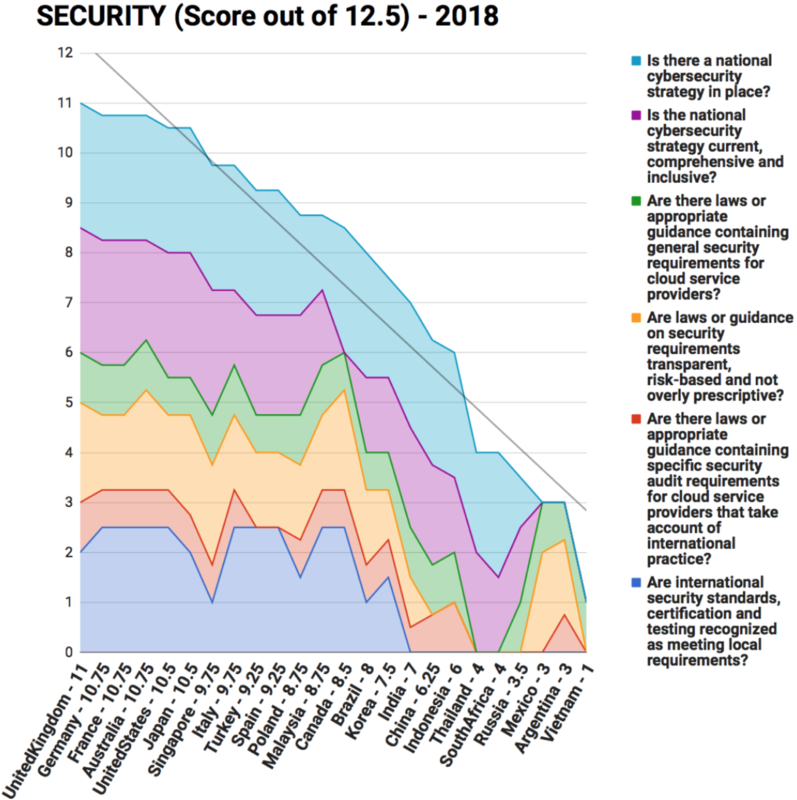 Mexico, Argentina, and Vietnam record the lowest scores — mainly due to delay in implementing national cybersecurity strategies.